Robert W. Morgan lost his battle with lung cancer on the evening of May 22, 1998. He is survived by his wife Shelley, daughter Susanna and brother Art Jr. He was 60 years old. This announcement aired hourly on KRTH, Los Angeles, Memorial Day Weekend. This was featured hourly during the KRTH Morgan show tribute on Tuesday, May 26th. Our thanks to Gene McArtor for making these available to the Bossography. 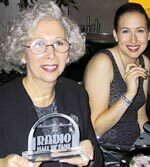 Shelley and Susanna Morgan with Robert W. Morgan's Radio Hall of Fame Award. On Saturday, November 20th 1999, ROBERT W. MORGAN was inducted into the RADIO HALL OF FAME at the Museum Of Broadcast Communications Cultural Center in downtown Chicago, for his noteworthy and pioneering contributions to the medium. His friend, and fellow Hall Of Fame inductee, Rush Limbaugh, enthusiastically introduced Robert's radio retrospective and presented the award to Morgan's wife Shelley and their daughter, Susanna. Robert's induction officially places him in the company of some of America's true great radio legends. You can see the ceremony at www.radiohof.org. ©1998-2008 Kevin Gershan and REELRADIO. All Rights Reserved.